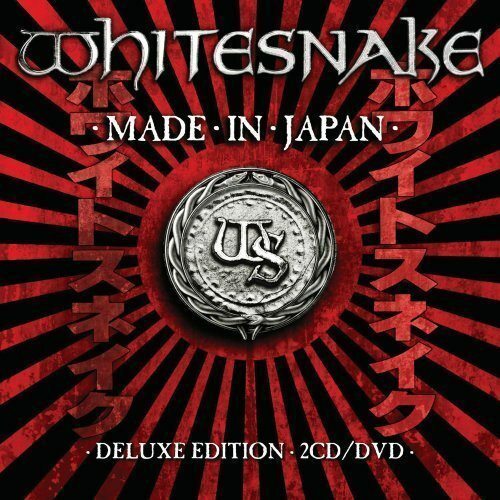 Frontiers Records is pleased to announce whitesnake’s highly anticipated live concert “Made In Japan” – released on Deluxe 2CD/DVD Edition, Blu-ray and DVD in the UK on Monday April 22nd (North American release is Tuesday April 23rd). The performance was initially recorded for Japanese TV and future Loud Park promotions, but after three songs were broadcast on a Loud Park highlights program in Japan, Whitensake received unprecedented requests for this performance to be made available for general release. Having spent most of 2012 editing and mixing the Japanese concert in stunning HD as a multi format DVD-CD in 5.1 and stereo, just prior to commencing the ‘Year Of The Snake’ 2013 World Tour, this exceptional performance is a welcome addition to the history of Whitesnake live releases. Now fans can relive the irresistible magic of Whitesnake in concert any time their heart and loins may desire! The ‘Forevermore’ songs alone are worth the price of admission, not forgetting the classic Whitesnake songs, “Is This Love,” “Still Of The Night” and “Here I Go Again,” all peformed at the height of their musical powers. It’s all here. This is what Whitesnake fans, new and old, have been clamouring for. Highlights include blistering guitar work from the band’s six string guitar slingers, Doug Aldrich and Reb Beach, who both celebrate their 10th anniversary with the band this year. Whitesnake also features the earth-shaking rhythm section, The Wrecking Crew featuring Michael Devin (bass) and Briian Tichy (drums), who anchor the deep and dirty foundation of Whitesnake. The band is accompanied by the swirling sonic tapestries of special guest keyboardist Brian Ruedy, and of course, the chest beating, seductive vocals of front man and founder, David Coverdale. Whitesnake has a respected reputation as one of the world’s leading rock’n’roll bands. Founded and formed by Deep Purple singer David Coverdale, the band have earned multi-platinum albums and multiple top 10 hits worldwide, including 2 number 1 smash hit singles with Here I Go Again and Is This Love, and more recently with Still Of The Night. Harnessing Coverdale’s blues and soul roots and fuelled by incendiary guitarists Doug Aldrich, Reb Beach and bassist Michael Devin, you have all the elements that comprise Whitesnake’s rock credentials. On the upcoming UK tour Whitesnake will be joined by the Tommy Aldridge on drums and percussion.